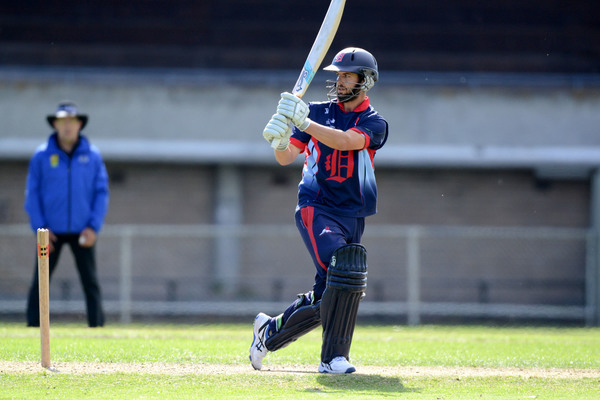 Dandenong are off to a mixed start in the inaugural Victorian Super Slam, picking up a win but also two losses in an action packed week of Twenty20 cricket. At a buzzing Central Reserve in Glen Waverley, the inaugural Super Slam kicked off on Sunday 25 November, with the Panthers starting with mixed results. The Panthers took on the Prahran True Blues on the South oval for the early 9.00am fixture, and compiled a competitive 129 in 19.4 overs, with gun opener Brett Forsyth the only one to get off the chain with a typically classy 46 off 42 balls. Englishman and marquee spinner Karl Carver got the Panthers off to a perfect start in their defence, picking up the key scalp of True Blues star Shaun Miller, but a series of partnerships, halted the Panthers from making too much of a dent in the chase, with Will Sutherland (30) and Adam Bull (25) building the platform. The True Blues eventually took the points with three balls and four wickets left in the shed. The Panthers and local rivals, the Casey-South Melbourne Swans then did battle for the final match of the day, and similar to the thrilling two-day match played the weekend prior, it once again went down to the wire. A brilliant run out by Swans keeper Devin Pollock orchestrated the dismissal of Brett Forsyth in the opening overs, but James Nanopoulos (50) and Suraj Randiv (15) managed to knock the ball around smartly, putting on 29 runs before Hallam-Kalora Park all-rounder Jordan Hammond (3/17) managed to snag Randiv. Hammond got through the gate of the dangerous Lincoln Edwards before he could get settled, but Nanopoulos and Ed Newman (17) started to look comfortable on a pitch that wasn’t exactly conducive to batting all day. Despite Hammond bowling with great energy and proving he belongs at the Premier level, the Panthers managed to claw their way to 6/127 at the end of the 20 overs, with Comrey Edgeworth’s run-a-ball 16 helping them along the way. The Swans lost danger man Dale Tormey early, with off-spinner Suraj Randiv (2/22) forcing the star to chop on, and with Jared Maxwell (35) and Luke Wells (23) looking set, the Swans raced out to 1/48 and in a strong position. Randiv and fellow spinner Akshat Buch (2/16) brought the game back to life, forcing plenty of mistakes as they tightened the screws and cut off the boundaries. As he did in the opening match, Nuwan Kulasekera (24 off 19 balls) managed to reverse the tide and find some much needed momentum, and with just an over left, the Swans needed seven runs for victory. But a brilliant final over from emerging quick Jakeb Thomas (3/27) denied the Swans a victory, finishing on 7/124 after their 20 overs. And last Tuesday evening, the Panthers were unable to capitalise on a bright start against Camberwell Magpies at home, losing by 36 runs. The Panthers sent the Magpies in, and struck immediately, with Lewis McManus dismissed first ball of the match, and the key wickets of Oliver Gunning and Tom Russ only moments later had the visitors scrambling at 3/12. But, classy batsman Adit Pawha (43) managed to stave off the home side’s momentum, counter attacking brilliantly to set up a competitive total of 8/136. Once again, spinners Suraj Randiv (3/22) and Akshat Buch (2/23) impressed, but the Magpies managed to find plenty of runs off the seamers. The Panthers were never really in the contest after falling to 4/34 and with gun bats Brett Forsyth, skipper Tom Donnell and James Nanopoulos, and managed to claw their way to 100 before Comrey Edgeworth’s (32) lone hand came to an end. Continuing his brilliant season, Will Walker (3/20) once again took key wickets, while Magpies champ Tom Russ (3/7) was stellar. The Panthers have a chance to bounce back when they take the Monash Tigers on at Central Reserve on Tuesday evening.